Half a night’s sleep, waking up in the dark, in a freezing cold tent, and getting dressed by the beam of a head torch. Trying to have breakfast in the middle of the night when you’re not remotely hungry. Waiting around in the cold night air for your companions to get ready. Trudging for hours in the pitch blackness and seeing nothing at all of your surroundings. All you watch for hour after hour are the legs of the person in front by the beam of a head torch. Getting increasingly cold as the night goes on (the coldest part of the night is just before dawn) and yearning for the sunrise and the chance to warm up again. Having no photographs of your ascent to remember it by. (Sometimes) slowing down as you approach the top, and waiting in the cold because you realise it’s still going to be dark when you reach the summit. Descending the mountain tired, during daylight, and discovering what you missed on the way up. Being tired for the rest of the day because you got up in the middle of the night after only half a night’s sleep. With all these negatives ruining your enjoyment of a climb, you might be wondering why people climb mountains at night. Well, sometimes it’s necessary. Here are some reasons. On some alpine routes, you need to climb before the sun hits the slopes and melts the ice. Once the sun is up, there’s an increased risk of rockfall and avalanches, and of crevasses opening up. In some parts of the world, days start crisp and clear, but cloud over sometime in the morning. In these places it’s good to reach the summit early before the views disappear into cloud. Sometimes an ascent is so long that it might be impossible to complete it entirely during daylight. In these situations it may be better to climb in darkness at the start of your ascent, while you are still fresh, rather than at the end, when you are tired. Some people like to experience the sunrise from the top of a mountain (personally I don’t care whether I see the sunrise down below, or halfway up, and it’s never as important to me as the climb itself). Sometimes none of these conditions apply, but people still get up early and climb during the night. This often happens on popular, guided peaks, where climbing at night has become the norm, and reaching the summit is considered more important than enjoying the experience. In Ecuador it has become the norm to start the climbs of the glaciated volcanoes at the stupidly early time of midnight. But apart from Chimborazo, they are not really big enough to justify this. 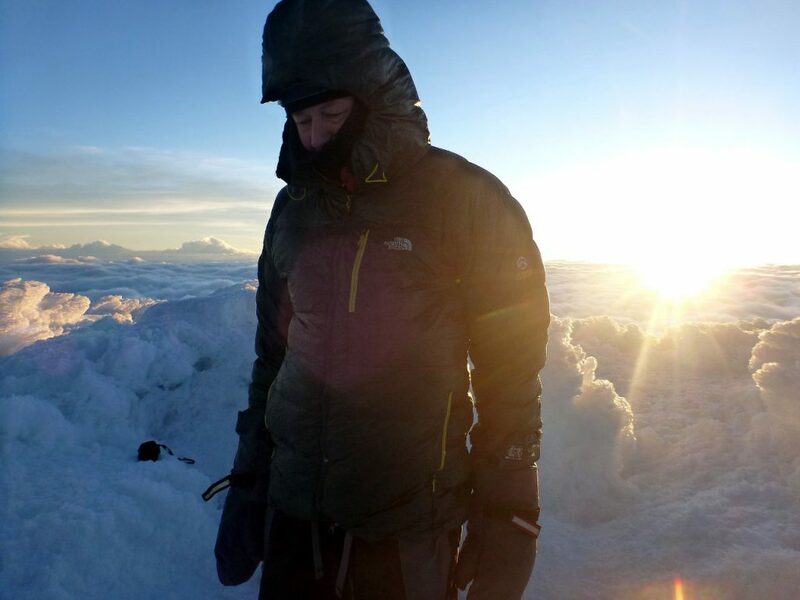 On Cayambe last year we reached the summit just as dawn was breaking. 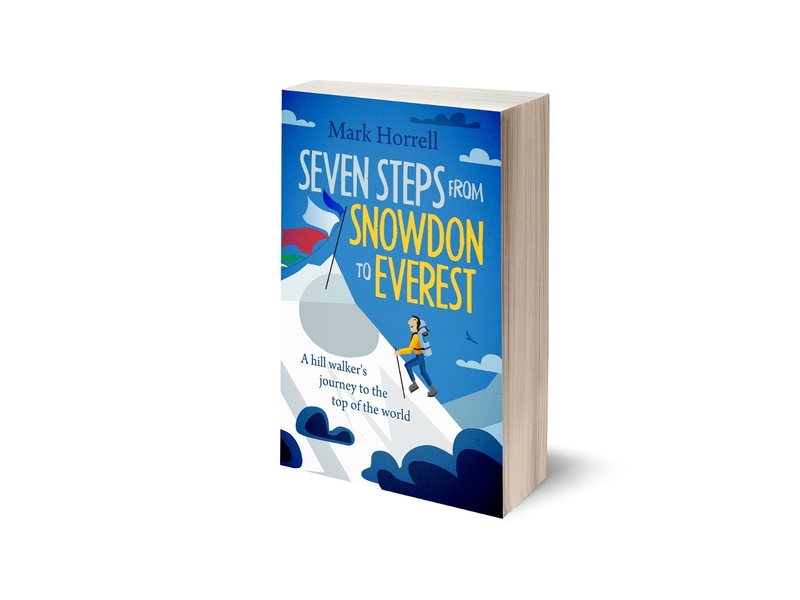 I was very grumpy because I’d completed the majority of the climb and not seen a single thing (some people say that the summit is only halfway, but in reality it usually takes 4 or 5 times as long to get up a mountain than it does to go back down again). We had passed through some amazing ice formations on the way, but I was only vaguely aware of them and had not a single photograph of us climbing through them. I became increasingly cold as the climb went on, and by the time we reached the summit my fingers were so freezing I could barely operate my camera. Taking my mitts off to do so only made them colder. Aside from my summit photos, I only have a handful of photos of that day, and they were all taken on the way down. There is another way. On Aconcagua it has also become the norm to start summit day in the small hours, but in 2010 I was lucky enough to climb it with an enlightened guide, Augusto Ortega. We set off at 7.30, when the sun was already hitting the slopes, but he told us to put our head torches in our packs in case we returned after dusk. We didn’t need them, and I enjoyed every minute of the ascent, tiring as it was. 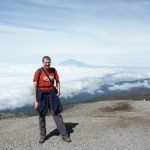 I’ve just completed my Christmas trip to Tanzania, where we climbed Mount Meru and Kilimanjaro. These are both mountains where night-time ascents have become the norm. For us they were two contrasting ascents. 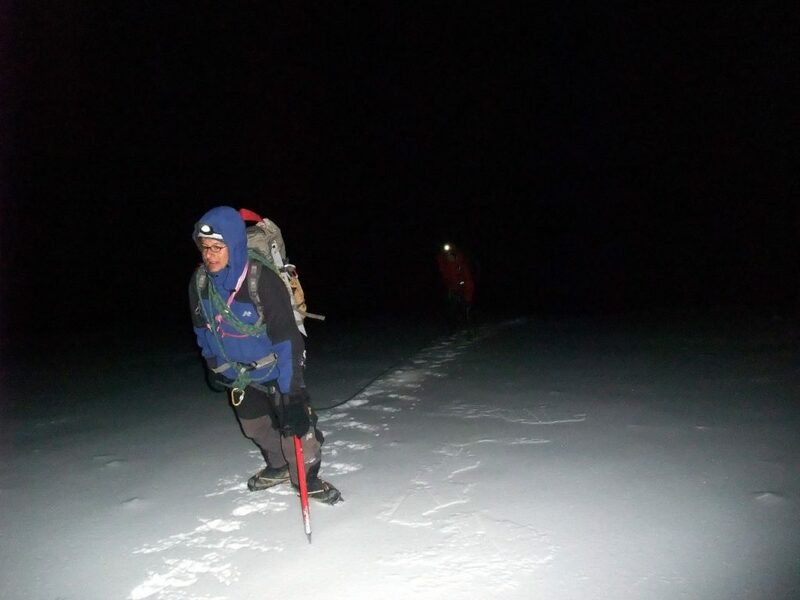 On Meru, we stuck to tradition and set off around 1am. We completed the entire ascent in darkness, after a few stops along the way to slow us down. We arrived on the summit just as the sun was rising, and once again I was very grumpy. To begin with, my fingers were too cold to take my mitts off and operate the camera, but it wouldn’t have mattered anyway. There was a great view down below me, but I knew it was too dark for any photos to come out. Luckily it wasn’t so cold to go down immediately, and we were able to wait half an hour for the sun. I had to discover the terrain on the way down, and once again, I have no photos at all of us going up. 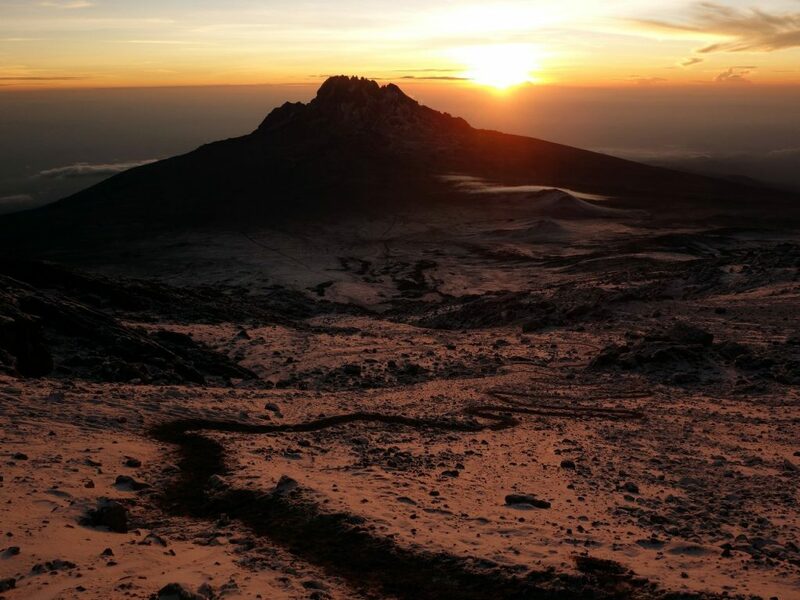 Meru was our acclimatisation peak. On Kilimanjaro it was a different story, and we were determined not to make the same mistake. We were to end the day by camping in the crater, only 150m below the summit, so we had a much shorter descent than the rest of the trekkers. We were also pre-acclimatised from Meru, and far more experienced at high altitude than the majority of trekkers on the mountain. There was simply no need for us to set off at 1am like everyone else, and climb with the hordes. So we left just after 4am, and had only two hours in darkness. We climbed alone, which is always more enjoyable than following a line of head torches, and asking people in front to let you past. 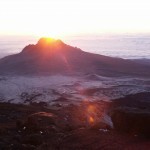 We were halfway up to Gillman’s Point when we watched the sunrise over Mawenzi across The Saddle. It was amazing, and it would have been worse from the summit, obscured by much of the crater. Unlike on Meru I have lots of photos and video footage of our ascent. We made good time, and reached the summit in only five hours. The sky was still clear, but most of the other summiteers had got there before us, so we had the summit largely to ourselves. I was also warm, because the sun had been out for three hours. It was a magical experience that I will be writing about in more detail later. Night-time ascents nearly always spoil the enjoyment of a climb, and should be avoided wherever possible. Not all guides see it this way, though. They believe their priority is to get their clients to the summit, and enjoying the experience is of secondary importance. In fairness to them, many of their clients may feel this way too. But for those of us who are there to enjoy the whole thing and reach the summit as well, then it’s always preferable to delay the start for as long as possible to maximise climbing during daylight. If you’re a guide who feels this way too, then I would be happy to hear from you. Whilst there is a lot in what you say I still think that my most memorable ascent was climbing Ben Moor above Crianlarich under a full moon on a crisp snowy February night. Started at about 11pm and sumitted three hours later. The snow clad mountain illuminated by the Moon and with stars visible was awesome. I have seen much less on a more typical clagged in daytime ascent. When booking a climb how does a climber ensure the guide will maximise the experience by climbing in daylight instead of just night time? By booking a private trip instead of going with a group. You could try asking when you book, but you may be told to ask your guide when you get there. It’s a decision for the guide rather than the person taking the booking, and depends on things like weather, conditions on the trail, speed of climbers, etc. These are all factors that can only be taken into consideration nearer the time. Having just finished one on Orizaba myself I couldn’t agree more. If there is an upside though it would be that we are like horses with blinders on able to see the dangers we have ascended. That’s one reason. There’s also the added logistics involved in putting in an extra camp. But the main reason is the extra time spent at a very high altitude. Not only is the summit push a day longer, but there’s an extra night spent 500m higher, at some 8400-8500m. The risk of altitude sickness is very much higher. In the old days they used to put in that extra camp. These days it’s felt that a longer summit day, going up 1000m and coming back down again, is safer. Also, early climbers lacked modern clothing,lighting, and oxygen equipment, and therefore they preferred to climb in the daylight. 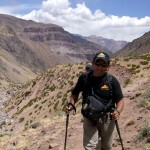 Dear Mark, I used to be hill hikker who arrived to Ecuador two years ago. 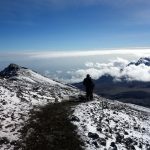 Since them, I have done the Cayambe and Antisana (beatifull) and many other lower mountains in the volcano avenue. Since the very beguinning I have been telling guides to do the ascents in daylaight, but they all say it is not safe because of the ice warming during day. I am just not experienced enought to refute therit argument and the least I want to do is to put in danger a guide or me. My personal feeling is the same you explain, getting up at 10:30 pm, and do the whole ascend at nighttime is equal to be missing 90% of the ascend. ¿Are they right pointing out the security as and argument?. Hi Jorge, There is “not safe”, and there is “not as safe”. These are two different things. It’s certainly true that glaciated mountains are less safe during the day. Rocks are often held in place by ice, and when the ice melts during warm sunshine, there is an increased risk of rockfall. Similarly crevasses open up as the sun warms them; snow bridges across them, that may have held firm during the night, become softer; and there is a greater risk of them collapsing as you walk across, etc. It’s also true that mountaineering is a risky activity, and while it’s not possible to eliminate risk (even at night), there are ways of reducing the risk. Rockfall can be avoided by choosing a different route. It used to be common at the start of the route from Carrel Hut on Chimborazo, but now guides reduce the risk by heading along the west ridge instead of underneath it, as they used to. The risk from crevasses is reduced in all sorts of ways, such as roping up, having more people on the rope, keeping the rope tight, and having more rope between each climber. And of course, becoming more experienced at glacier travel, which makes you more adept at avoiding crevasses! Personally I think if guides are telling you it’s not safe (as opposed to telling you its not *as* safe) then it’s a bit a cop out. I’m sure it makes their job easier if they make their clients climb entirely at night, but they are also giving their clients a more disappointing and less enjoyable experience. IMHO, it’s perfectly possible to set off later so that you have a bit more daylight to enjoy, and still keep within an acceptable level of risk. It may make the guide’s job harder, but a good guide will be prepared to do that in exchange for giving you a more pleasurable experience. I must say that night time ascents can be useful psychologically. When my husband and I did Kilimanjaro (and Meru prior to that), we started at the usual midnight time. It was quite cold, but not frostbite cold. We summitted a bit early and had to wait for the sunrise, which was cold also. However, on our way down, after the sunrise, when it did warm up quite a bit, we passed dozens of people heading up, all of them looking quite miserable. For me, ascending during the dark is way easier psychologically, since you can’t see how far you need to go, you don’t get discouraged. You just keep plodding on, and at some point the angle levels off, and you’re there. I’m not sure why there are night time ascents of Kilimanjaro, since there is no danger in waiting for daytime. At the time there was one company that advertised daytime ascents. This was in 2009 or so, so perhaps things have changed. And yes, I agree that much is missed during the night, but for me, it made the ascent quite easy, not knowing how much farther was left. When I used to climb in the French Alps, starts were often at 1 or 3 a.m., to avoid the risk of avalanche. These I remember very fondly, crossing the glacier in the dark, in the quiet, with millions of stars above, hearing only your own breathing (since we were roped up) and crunch of crampons in the glacier. That was magic for me. But those were just the first couple hours, the rest would be in daylight.